Wear your pearls often. The natural texture of your skin helps to keep them lustrous and beautiful. Always take off jewellery to apply perfume or hair spray and don't expose pearls to solvents or detergent. Never use steam or ultrasonic cleaners, but wash them from time to time, with clean water, mild soap and a soft cloth. Hang them up to dry thoroughly before you put them away, but don't heat them. Pearls are a product of nature, the only gemstones to grow organically within a living creature. Throughout history, people have always loved their mysterious, irridescent beauty. Until fairly recently, it was dangerous and difficult work to dive for pearls, and they were rare and very expensive. However, cultivation methods today produce excellent quality pearls at a price that puts them within reach of everyone. We use Akoya pearls and cultured fresh-water pearls. There is no universal or scientific system for grading pearls. Quality is judged, by an experienced eye, according to shape, colour and lustre, and graded from A - AAA. For our higher-priced pieces, we use these especially fine pearls. However, ungraded pearls, although cheaper, are often very beautiful,and we use them to make exciting and glamorous jewellery at surprisingly low prices. 'Baroque' pearls are great fun. This is the word jewellers use to describe a gemstone or pearl that is asymmetrical or irregular in shape. We use them for many lower priced pieces. Each interesting, naturally-shaped pearl is unique and brings character to a design. Black pearls are very rare in nature. They are seldom truly black, but usually subtly-coloured, with tones of green, purple, brown, blue, 'peacock' or bronze. Knots: For most pieces, we hand-knot the silk 'string' between each pearl. This is a highly-skilled job and serves to prevent one pearl from rubbing against the next and causing friction damage. Also, in case a strand should break, they will not roll away and get lost. We make pearl or gemstone jewellery to your design - usually at no extra charge! Expert re-stringing, with individual hand-knotting where required. Fast, personal service - all work guaranteed - and the best prices in the UK. You are welcome to call in to our shop, in Nairn, a lovely town on the Moray Firth, about 13 miles east of Inverness, Scotland. 'Shell pearls', 'Seashell' pearls, Majorica pearls, Red Sea pearls, Lotus pearls, etcera, are artificial beads dipped in a pearly coating. They are simulated, 'faux' or artificial 'pearls' that look nice - lots of people send them for re-stringing. For most pieces, we hand-knot the silk 'string' between each pearl. This is a highly-skilled job and serves to prevent one pearl from rubbing against the next and causing friction damage. Also, in case a strand should break, they will not roll away and get lost. The most valuable pearls occur spontaneously in the wild, but they are extremely rare. These wild pearls are referred to as natural pearls. Cultured or farmed pearls from pearl oysters and freshwater mussels make up the majority of those that are currently sold. Imitation pearls are also widely sold in inexpensive jewelry, but the quality of their iridescence is usually very poor, and often, artificial pearls are easily distinguished from genuine pearls. Pearls have been harvested and cultivated primarily for use in jewellery, but in the past they were also stitched onto lavish clothing. Pearls have also been crushed and used in cosmetics, medicines, and in paint formulations. Whether wild or cultured, gem quality pearls are almost always nacreous and iridescent, as is the interior of the shell that produces them. However, almost all species of shelled mollusks are capable of producing pearls (formally referred to as "calcareous concretions" by some sources) of lesser shine or less spherical shape. Although these may also be legitimately referred to as "pearls" by gemological labs and also under U.S. Federal Trade Commission rules, and are formed in the same way, most of them have no value, except as curiosities. Pearls are commonly viewed by scientists as a by-product of an adaptive immune system-like function. Almost any shelled mollusk can, by natural processes, produce some kind of "pearl" when an irritating microscopic object becomes trapped within the mollusk's mantle folds, but the great majority of these "pearls" are not valued as gemstones. Nacreous pearls, the best-known and most commercially-significant pearls, are primarily produced by two groups of molluscan bivalves or clams. A nacreous pearl is made from layers of nacre, by the same living process as is used in the secretion of the mother of pearl which lines the shell. A "natural pearl" or "wild pearl" is one that forms without any human intervention at all, in the wild, and is very rare. Many hundreds of pearl oysters or pearl mussels have to be gathered and opened, and thus killed, in order to find even one wild pearl, and for many centuries that was the only way pearls were obtained. This was the main reason why pearls fetched such extraordinary prices in the past. A cultured pearl is formed in a pearl farm, using human intervention as well as natural processes. Akoya pearl grafting shed in Xuwen, China. Because pearls are made primarily of calcium carbonate, they can be dissolved in vinegar. Calcium carbonate is susceptible to even a weak acid solution because the crystals of calcium carbonate react with the acetic acid in the vinegar to form calcium acetate and carbon dioxide. Shell of one species of freshwater pearl mussel, Margaritifera margaritifera. The difference between wild and cultured pearls focuses on whether the pearl was created spontaneously by nature – without human intervention – or with human aid. Pearls are formed inside the shell of certain mollusks as a defense mechanism against a potentially threatening irritant such as a parasite inside its shell, or an attack from outside, injuring the mantle tissue. The mollusk creates a pearl sac to seal off the irritation. The mantle of the mollusk deposits layers of calcium carbonate (CaCO3) in the form of the mineral aragonite or a mixture of aragonite and calcite (polymorphs with the same chemical formula, but different crystal structures) held together by an organic horn-like compound called conchiolin. The combination of aragonite and conchiolin is called nacre, which makes up mother-of-pearl. The commonly held belief that a grain of sand acts as the irritant is in fact rarely the case. Typical stimuli include organic material, parasites, or even damage that displaces mantle tissue to another part of the mollusk's body. These small particles or organisms gain entry when the shell valves are open for feeding or respiration. In cultured pearls, the irritant is typically an introduced piece of the mantle epithelium, with or without a spherical bead (beaded or beadless cultured pearls). Typically, the build-up of a natural pearl consists of a brown central zone formed by columnar calcium carbonate (usually calcite, sometimes columnar aragonite) and a yellowish to white outer zone consisting of nacre (tabular aragonite). In a pearl cross-section such as the diagram, these two different materials can be seen. The presence of columnar calcium carbonate rich in organic material indicates juvenile mantle tissue that formed during the early stage of pearl development. Displaced living cells with a well-defined task may continue to perform their function in their new location, often resulting in a cyst. Such displacement may occur via an injury. The fragile rim of the shell is exposed and is prone to damage and injury. Crabs, other predators and parasites such as worm larvae may produce traumatic attacks and cause injuries in which some external mantle tissue cells are disconnected from their layer. Embedded in the conjunctive tissue of the mantle, these cells may survive and form a small pocket in which they continue to secrete their natural product: calcium carbonate. The pocket is called a pearl sack, and grows with time by cell division; in this way the pearl grows also. The juvenile mantle tissue cells, according to their stage of growth, produce columnar calcium carbonate, which is secreted from the inner surface of the pearl sack. With ongoing time the external mantle cells of the pearl sack proceed to the formation of tabular aragonite. When the transition to nacre secretion occurs, the brown pebble becomes covered with a nacreous coating. As this process progresses, the shell itself grows, and the pearl sack seems to travel into the shell. However, it actually stays in its original relative position within the mantle tissue. After a couple of years, a pearl will have formed and the shell might be found by a lucky pearl fisher. Cultured pearls are the response of the shell to a tissue implant. A tiny piece of mantle tissue from a donor shell is transplanted into a recipient shell. This graft will form a pearl sac and the tissue will precipitate calcium carbonate into this pocket. There are a number of options for producing cultured pearls: use freshwater or seawater shells, transplant the graft into the mantle or into the gonad, add a spherical bead or do it non-beaded. The majority of saltwater cultured pearls are grown with beads. The trade name of the cultured pearls are Akoya, white or golden South sea, and black Tahitian. The majority of beadless cultured pearls are mantle-grown in freshwater shells in China, known as freshwater cultured pearls. Cultured pearls can be distinguished from natural pearls by X-ray examination. Nucleated cultured pearls are often 'pre-formed' as they tend to follow the shape of the implanted shell bead nucleus. Once the pre-formed beads are inserted into the oyster, it secretes a few layers of nacre around the outside surface of the implant before it is removed after six months or more. When a cultured pearl with bead is X-rayed, it reveals a different structure to that of a natural pearl. A beaded cultured pearl shows a solid center with no concentric growth rings, whereas a natural pearl shows a series of concentric growth rings. 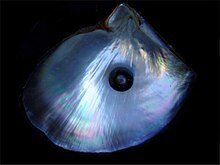 A beadless cultured pearl (whether of freshwater or saltwater origin) may show growth rings, but also a complex central cavity, witness of the first precipitation of the young pearl sac. Some imitation pearls are simply made of mother-of-pearl, coral or conch shell, while others are made from glass and are coated with a solution containing fish scales called essence d'Orient. Although imitation pearls look the part, they do not have the same weight or smoothness as real pearls, and their luster will also dim greatly. A well equipped gem testing laboratory is able to distinguish natural pearls from cultured pearls by using a gemological x-ray in order to examine the center of a pearl. With an x-ray it is possible to see the growth rings of the pearl, where the layers of calcium carbonate are separated by thin layers of conchiolin. The differentiation of natural pearls from non-beaded cultured pearls can be very difficult without the use of this x-ray technique. Quality natural pearls are very rare jewels. The actual value of a natural pearl is determined in the same way as it would be for other "precious" gems. The valuation factors include size, shape, color, quality of surface, orient and luster. The Great Depression effectively slashed the value of the natural pearl, but there is no doubt that it had been some time coming. The introduction and advance of the cultured pearl hit the pearl industry hard; it had pearl dealers publicly disputing over the authenticity of these new cultured pearls, and left many consumers uneasy and confused about the much lower prices. Essentially, it damaged the image of both natural and cultured pearls alike. By the 1950s, an era of every woman being able to own her own pearl necklace had begun, and natural pearls were reduced to a small, exclusive niche in the pearl industry. 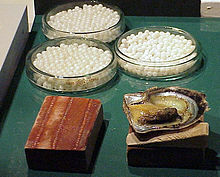 Keshi pearls, although they often occur by chance, are not considered natural pearls. They are a byproduct of the culturing process, and hence do not happen without human intervention. These pearls are quite small: typically a few millimeters in size. Keshi pearls are produced by many different types of marine mollusks and freshwater mussels in China. Keshi pearls are actually a mistake in the cultured pearl seeding process. In seeding the cultured pearl, a piece of mantle muscle from a sacrificed oyster is placed with a bead of mother of pearl within the oyster. If the piece of mantle should slip off the bead, a pearl forms of baroque shape about the mantle piece which is entirely nacre. Therefore, a Keshi pearl could be considered superior to cultured pearls with a mother of pearl bead center. In the cultured pearl industry, the resources used to create a mistaken all nacre baroque pearl is a drain on the production of round cultured pearls. Therefore, they are trying to improve culturing technique so that keshi pearls do not occur. All nacre pearls may one day be limited to natural found pearls. Today many "keshi" pearls are actually intentional, with post-harvest shells returned to the water to regenerate a pearl in the existing pearl sac. Tahitian pearls, frequently referred to as black pearls,] are highly valued because of their rarity; the culturing process for them dictates a smaller volume output and they can never be mass produced because, in common with most sea pearls, the oyster can only be nucleated with one pearl at a time, while freshwater mussels are capable of multiple pearl implants. Before the days of cultured pearls, black pearls were rare and highly valued for the simple reason that white pearl oysters rarely produced naturally black pearls, and black pearl oysters rarely produced any natural pearls at all. The Queen is shown wearing her rope of famous black pearls. Since the development of pearl culture technology, the black pearl oyster found in Tahiti and many other Pacific Island areas has been extensively used for producing cultured pearls. The rarity of the black cultured pearl is now a "comparative" issue. The black cultured pearl is rare when compared to Chinese freshwater cultured pearls, and Japanese and Chinese akoya cultured pearls, and is more valuable than these pearls. However, it is more abundant than the South Sea pearl, which is more valuable than the black cultured pearl. This is simply because the black pearl oyster Pinctada margaritifera is far more abundant than the elusive, rare, and larger south sea pearl oyster Pinctada maxima, which cannot be found in lagoons, but which must be dove for in a rare number of deep ocean habitats or grown in hatcheries. Black cultured pearls from the black pearl oyster – Pinctada margaritifera – are not South Sea pearls, although they are often mistakenly described as black South Sea pearls. In the absence of an official definition for the pearl from the black oyster, these pearls are usually referred to as "black pearls". The correct definition of a South Sea pearl – as described by CIBJO and GIA – is a pearl produced by the Pinctada maxima pearl oyster. South Sea pearls are the color of their host Pinctada maxima oyster – and can be white, silver, pink, gold, cream, and any combination of these basic colors, including overtones of the various colors of the rainbow displayed in the pearl nacre of the oyster shell itself. South Sea pearls are produced in various parts of the world. White ones tend to come from the Broome area of Australia while golden ones are from the Philippines. Pearls are also produced in the Cook Islands and one farm in the Sea of Cortez, Mexico, from Concha Nácar the rainbow lipped oyster; these pearls fluoresce red under ultraviolet light. Biologically speaking, under the right set of circumstances, almost any shelled mollusk can produce some kind of pearl, however, most of these molluscan pearls have no luster or iridescence. The great majority of mollusk species produce pearls which are not attractive, and are sometimes not even very durable, such that they usually have no value at all, except perhaps to a scientist, a collector, or as a curiosity. These objects used to be referred to as "calcareous concretions" by some gemologists, even though a malacologist would still consider them to be pearls. Valueless pearls of this type are sometimes found in edible mussels, edible oysters, escargot snails, and so on. The GIA and CIBJO now simply use the term 'pearl' (or, where appropriate, the more descriptive term 'non-nacreous pearl') when referring to such items and, under Federal Trade Commission rules, various mollusc pearls may be referred to as 'pearls', without qualification. A few species produce pearls that can be of interest as gemstones. These species include the bailer shell Melo, the giant clam Tridacna, various scallop species, Pen shells Pinna, and the Haliotis iris species of abalone. Abalone, or Pāua are Mabe pearls unique to New Zealand waters and are commonly referred to as 'Blue Pearls'. They are admired for their incredible luster and naturally bright vibrant colors that are often compared to Opal. Another example is the conch pearl (sometimes referred to simply as the 'pink pearl'), which is found very rarely growing between the mantle and the shell of the queen conch or pink conch, Strombus gigas, a large sea snail or marine gastropod from the Caribbean Sea. These pearls, which are often pink in color, are a by-product of the conch fishing industry, and the best of them display a shimmering optical effect related to chatoyance known as 'flame structure'. In 1999, the world auction record for a Melo pearl was US$488,311 for a single pearl. Somewhat similar gastropod pearls, this time more orange in hue, are (again very rarely) found in the horse conch Pleuroploca gigantea. The largest pearl known was found in the Philippines in 1934 and is known as the Pearl of Lao Tzu. It is a naturally-occurring, non-nacreous, calcareous concretion (pearl) from a giant clam. Because it did not grow in a pearl oyster it is not pearly; instead the surface is glossy like porcelain. Other pearls from giant clams are known to exist, but this is a particularly large one, weighing 14 lb (6.4 kg). For thousands of years, most seawater pearls were retrieved by divers working in the Indian Ocean, in areas like the Persian Gulf, the Red Sea and in the Gulf of Mannar. [Starting in the Han Dynasty (206 BC–220 AD), the Chinese hunted extensively for seawater pearls in the South China Sea. In the 14th-century Arabian Sea, the traveller Ibn Battuta provided the earliest known description of pearl diving by means of attaching a cord to the diver's waist. When Spanish conquistadors arrived in the Western Hemisphere, they discovered that around the islands of Cubagua and Margarita, some 200 km north of the Venezuelan coast, was an extensive pearl bed (a bed of pearl oysters). One discovered and named pearl, La Peregrina pearl, was offered to the Spanish queen] According to Garcilasso de la Vega, who says that he saw La Peregrina at Seville in 1607, (Garcilasso, "Historie des Incas, Rois du Perou," Amsterdam, 1704, Vol. II, P. 352.) this was found at Panama in 1560 by a slave worker who was rewarded with his liberty, and his owner with the office of alcalde of Panama. Today, the cultured pearls on the market can be divided into two categories. The first category covers the beaded cultured pearls, including Akoya, South Sea and Tahiti. These pearls are gonad grown, and usually one pearl is grown at a time. This limits the number of pearls at a harvest period. 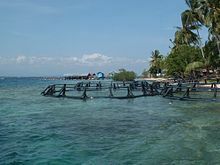 The pearls are usually harvested after one year for akoya, 2–4 years for Tahitian and South Sea, and 2–7 years for freshwater. This perliculture process was first developed by the British biologist William Saville-Kent who passed the information along to Tatsuhei Mise and Tokichi Nishikawa from Japan. The second category includes the non-beaded freshwater cultured pearls, like the Biwa or Chinese pearls. As they grow in the mantle, where on each wing up to 25 grafts can be implanted, these pearls are much more frequent and saturate the market completely. An impressive improvement in quality has taken place in the last ten years when the former rice grain-shaped pebbles are compared with the near round pearls of today. In the last two years large near perfect round bead nucleated pearls up to 15mm in diameter have been produced with metallic luster. The original Japanese cultured pearls, known as akoya pearls, are produced by a species of small pearl oyster, Pinctada fucata martensii, which is no bigger than 6 to 8 cm in size, hence akoya pearls larger than 10 mm in diameter are extremely rare and highly priced. Today, a hybrid mollusk is used in both Japan and China in the production of akoya pearls. In the past two decades, cultured pearls have been produced using larger oysters in the south Pacific and Indian Ocean. The largest pearl oyster is the Pinctada maxima, which is roughly the size of a dinner plate. South Sea pearls are characterized by their large size and warm luster. Sizes up to 14 mm in diameter are not uncommon. South Sea pearls are primarily produced in Australia, Indonesia, and the Philippines. After WWII, new south sea pearl projects were commenced in the early 1950s in Burma and Kuri Bay and Port Essington in Australia. Japanese companies were involved in all projects using technicians from the original Mitsubishi south sea pre-war projects. For many cultured pearl dealers and wholesalers, the preferred weight measure used for loose pearls and pearl strands is momme. Momme is a weight measure used by the Japanese for centuries. Today, momme weight is still the standard unit of measure used by most pearl dealers to communicate with pearl producers and wholesalers. One momme corresponds to 1/1000 kan. Reluctant to give up tradition, in 1891, the Japanese government formalized the kan measure as being exactly 1 kan = 3.75 kilograms or 8.28 pounds. Hence, 1 momme = 3.75 grams or 3750 milligrams. Queen Barbara Radziwiłł in coronation robes and a wimple embroided with pearls. Girl with a Pearl Earring by Johannes Vermeer, c. 1665. Woman with a Pearl Necklace, by Jan Vermeer van Delft, 1665. Portrait of Marie Antoinette, Queen of France wearing a pearl necklace and earrings. Pearls come in eight basic shapes: round, semi-round, button, drop, pear, oval, baroque, and circled. Perfectly round pearls are the rarest and most valuable shape. Semi-rounds are also used in necklaces or in pieces where the shape of the pearl can be disguised to look like it is a perfectly round pearl. Button pearls are like a slightly flattened round pearl and can also make a necklace, but are more often used in single pendants or earrings where the back half of the pearl is covered, making it look like a larger, rounder pearl. In general, cultured pearls are less valuable than natural pearls, whereas imitation pearls almost have no value. One way that jewelers can determine whether a pearl is cultured or natural is to have a gem lab perform an x-ray of the pearl. If the x-ray reveals a nucleus, the pearl is likely a bead-nucleated saltwater pearl. If no nucleus is present, but irregular and small dark inner spots indicating a cavity are visible, combined with concentric rings of organic substance, the pearl is likely a cultured freshwater. Cultured freshwater pearls can often be confused for natural pearls which present as homogeneous pictures which continuously darken toward the surface of the pearl. Natural pearls will often show larger cavities where organic matter has dried out and decomposed. Earrings and necklaces can also be classified on the grade of the color of the pearl. While white, and more recently black, saltwater pearls are by far the most popular, other color tints can be found on pearls from the oceans. Pink, blue, champagne, green, black and even purple saltwater pearls can be encountered, but to collect enough of these rare colors to form a complete string of the same size and same shade can take years. The Hindu tradition describes the sacred Nine Pearls which were first documented in the Garuda Purana, one of the books of the Hindu mythology. Ayurveda contains references to pearl powder as a stimulant of digestion and to treat mental ailments. According to Marco Polo, the kings of Malabar wore a necklace of 104 rubies and pearls which was given from one generation of kings to the next. The reason was that every king had to say 104 prayers every morning and every evening. At least until the beginning of the 20th century it was a Hindu custom to present a completely new, undrilled pearl and pierce it during the wedding ceremony. The Pearl or Mukta in Sanskrit is also associated with many Hindu deities. The most famous being the Koustubha which Lord Vishnu wears on his chest. Apart from religious connotations, stories and folklore abound of pearls occurring in snakes, the Naaga Mani, and elephants, the Gaja Mukta. According to Rebbenu Bachya, the word Yahalom in the verse Exodus 28:18 means "pearl" and was the stone on the Hoshen representing the tribe of Zebulun. This is generally disputed among scholars, particularly since the word in question in most manuscripts is actually Yasepheh – the word from which jasper derives; scholars think that refers to green jasper (the rarest and most prized form in early times) rather than red jasper (the most common form). Yahalom is usually translated by the Septuagint as an "onyx", but sometimes as "beryl" or as "jasper"; onyx only started being mined after the Septuagint was written, so the Septuagint's term "onyx" probably does not mean onyx – onyx is originally an Assyrian word meaning ring, and so could refer to anything used for making rings. Yahalom is similar to a Hebrew word meaning hit hard, so some people think that it means diamond. The variation in possibilities of meaning for this sixth stone in the Hoshen is reflected in different translations of the Bible – the King James Version translates the sixth stone as diamond, the New International Version translates it as emerald, and the Vulgate translates it as jaspis – meaning jasper. There is a wide range of views among traditional sources about which tribe the stone refers to. In a Christian New Testament parable, Jesus compared the Kingdom of Heaven to a "pearl of great price" in Matthew 13: 45–46. "Again, the kingdom of heaven is like unto a merchant man, seeking goodly (fine) pearls: Who, when he had found one pearl of great price, went and sold all that he had, and bought it." Holy things are compared to pearls in Matthew 7:6. "Do not give dogs what is holy, and do not throw your pearls before pigs, lest they trample them underfoot and turn to attack you." The Pearl of Great Price is a book of scripture in The Church of Jesus Christ of Latter-day Saints. The English word jade (alternative spellings "jaid", "jadeite") is derived (via French l'ejade and Latin ilia) from the Spanish term piedra de ijada (first recorded in 1565) or "loin stone", from its reputed efficacy in curing ailments of the loins and kidneys. Nephrite is derived from lapis nephriticus, the Latin version of the Spanish piedra de ijada. Nephrite can be found in a creamy white form (known in China as "mutton fat" jade) as well as in a variety of green colours, whereas jadeite shows more colour variations, including blue, lavender-mauve, pink, and emerald-green colours. Of the two, jadeite is rarer, documented in fewer than 12 places worldwide. Translucent emerald-green jadeite is the most prized variety, both historically and today. As "quetzal" jade, bright green jadeite from Guatemala was treasured by Mesoamerican cultures, and as "kingfisher" jade, vivid green rocks from Burma became the preferred stone of post-1800 Chinese imperial scholars and rulers. Burma (Myanmar) and Guatemala are the principal sources of modern gem jadeite. In the area of Mogaung in the Myitkyina District of Upper Burma (Myanmar), jadeite formed a layer in the dark-green serpentine, and has been quarried and exported for well over a hundred years. Canada provides the major share of modern lapidary nephrite. Nephrite jade was used mostly in pre-1800 China as well as in New Zealand, the Pacific Coast and Atlantic Coasts of North America, Neolithic Europe, and Southeast Asia. In addition to Mesoamerica, jadeite was used by Neolithic Japanese and European cultures. During Neolithic times, the key known sources of nephrite jade in China for utilitarian and ceremonial jade items were the now depleted deposits in the Ningshao area in the Yangtze River Delta (Liangzhu culture 3400–2250 BC) and in an area of the Liaoning province and Inner Mongolia (Hongshan culture 4700–2200 BC). Dushan Jade was being mined as early as 6000 BC. In the Yin Ruins of the Shang Dynasty (1600 to 1050 BC) in Anyang, Dushan Jade ornaments were unearthed in the tomb of the Shang kings. Jade was used to create many utilitarian and ceremonial objects, from indoor decorative items to jade burial suits. Jade was considered the "imperial gem". From the earliest Chinese dynasties to the present, the jade deposits most in use were not only those of Khotan in the Western Chinese province of Xinjiang but other parts of China as well, such as Lantian, Shaanxi. There, white and greenish nephrite jade is found in small quarries and as pebbles and boulders in the rivers flowing from the Kuen-Lun mountain range eastward into the Takla-Makan desert area. The river jade collection is concentrated in the Yarkand, the White Jades (Yurungkash) and Black Jade (Karakash) Rivers. From the Kingdom of Khotan, on the southern leg of the Silk Road, yearly tribute payments consisting of the most precious white jade were made to the Chinese Imperial court and there worked into objets d'art by skilled artisans as jade had a status-value exceeding that of gold or silver. Jade became a favourite material for the crafting of Chinese scholars' objects, such as rests for calligraphy brushes, as well as the mouthpieces of some opium pipes, due to the belief that breathing through jade would bestow longevity upon smokers who used such a pipe. Jadeite, with its bright emerald-green, pink, lavender, orange and brown colours was imported from Burma to China only after about 1800. The vivid green variety became known as Feicui (翡翠) or Kingfisher (feathers) Jade. It quickly became almost as popular as nephrite and a favorite of Qing Dynasty's nouveau riche, while scholars still had strong attachment to nephrite (white jade, or Khotan), which they deem as the symbol of a nobleman. In the history of the art of the Chinese empire, jade has had a special significance, comparable with that of gold and diamonds in the West. Jade was used for the finest objects and cult figures, and for grave furnishings for high-ranking members of the imperial family. Due to that significance and the rising middle class in China, today the finest jade when found in nuggets of “mutton fat” jade — so-named for its marbled white consistency — can fetch $3,000 an ounce, a tenfold increase from a decade ago. The use of jade and other greenstone was a long-term tradition in Korea (c. 850 BC – AD 668). Jade is found in small numbers of pit-houses and burials. The craft production of small comma-shaped and tubular "jades" using materials such as jade, microcline, jasper, etc., in southern Korea originates from the Middle Mumun Pottery Period (c. 850–550 BC). Comma-shaped jades are found on some of the gold crowns of Silla royalty (c. 300/400–668 AD) and sumptuous elite burials of the Korean Three Kingdoms. After the state of Silla united the Korean Peninsula in 668, the widespread popularisation of death rituals related to Buddhism resulted in the decline of the use of jade in burials as prestige mortuary goods. Tools, weapons and ornaments were made of it; in particular adzes, the 'mere' (short club), and the Hei-tiki (neck pendant). These were believed to have their own mana, handed down as valuable heirlooms, and often given as gifts to seal important agreements. Nephrite jewellery of Maori design is widely popular with locals and tourists, although some of the jade used for these is now imported from British Columbia and elsewhere. Jade was a rare and valued material in pre-Columbian Mesoamerica. The only source from which the various indigenous cultures, such as the Olmec and Maya, could obtain jade was located in the Motagua River valley in Guatemala. Jade was largely an elite good, and was usually carved in various ways, whether serving as a medium upon which hieroglyphs were inscribed, or shaped into symbolic figurines. Generally, the material was highly symbolic, and it was often employed in the performance of ideological practices and rituals. With some exceptions, such as medical alert bracelets or military dog tags, jewellery normally differs from other items of personal adornment in that it has no other purpose than to look appealing, but humans have been producing and wearing it for a long time – with 100,000-year-old beads made from Nassarius shells thought to be the oldest known jewellery. Jewellery may be made from a wide range of materials, but gemstones, precious metals, beads and shells have been widely used. Depending on the culture and times jewellery may be appreciated as a status symbol, for its material properties, its patterns, or for meaningful symbols. Jewellery has been made to adorn nearly every body part, from hairpins to toe rings. The word jewellery itself is derived from the word jewel, which was anglicized from the Old French "jouel",] and beyond that, to the Latin word "jocale", meaning plaything. In British English the spelling can be written as jewelery or jewellery, while in U.S. English the spelling is jewelry. Most cultures have at some point had a practice of keeping large amounts of wealth stored in the form of jewellery. Numerous cultures move wedding dowries in the form of jewellery or create jewellery as a means to store or display coins. Alternatively, jewellery has been used as a currency or trade good; an example being the use of slave beads Many items of jewellery, such as brooches and buckles, originated as purely functional items, but evolved into decorative items as their functional requirement diminished. Wearing of amulets and devotional medals to provide protection or ward off evil is common in some cultures; these may take the form of symbols (such as the ankh), stones, plants, animals, body parts (such as the Khamsa) Hamsa, or glyphs (such as stylised versions of the Throne Verse in Islamic art). Although artistic display has clearly been a function of jewellery from the very beginning, the other roles described above tended to take primacy. It was only in the late 19th century, with the work of such masters as Peter Carl Fabergé and René Lalique, that art began to take primacy over function and wealth. This trend has continued into modern times, expanded upon by artists such as Robert Lee Morris, Ed Levin, and Alberto Repossi. Jewellery has been used to denote status. In ancient Rome, for instance, only certain ranks could wear rings;[ later, sumptuary laws dictated who could wear what type of jewellery, again based on rank. Cultural dictates have also played a significant role. For example, the wearing of earrings by Western men was considered effeminate in the 19th century and early 20th century. More recently, the display of body jewellery, such as piercings, has become a mark of acceptance or seen as a badge of courage within some groups but is completely rejected in others. Likewise, hip hop culture has popularised the slang term bling-bling, which refers to ostentatious display of jewellery by men or women. The first signs of jewellery came from the people in Africa. Perforated beads suggesting shell jewelry made from sea snail shells have been found dating to 75,000 years ago at Blombos Cave. In Kenya, at Enkapune Ya Muto, beads made from perforated ostrich egg shells have been dated to more than 40,000 years ago. In conjunction with gold jewellery, Egyptians used coloured glass, along with precious gems. The colour of the jewellery had significance. Green, for example, symbolised fertility. Although lapis lazuli and silver had to be imported from beyond the country’s borders, many other materials for jewellery were found in or near Egypt. Egyptian designs were most common in Phoenician jewellery. Also, ancient Turkish designs found in Persian jewellery suggest that trade between the Middle East and Europe was not uncommon. Women wore elaborate gold and silver pieces that were used in ceremonies. Starting in the late 18th century, Romanticism had a profound impact on the development of western jewellery. Perhaps the most significant influences were the public’s fascination with the treasures being discovered through the birth of modern archaeology and a fascination with Medieval and Renaissance art. Changing social conditions and the onset of the Industrial Revolution also led to growth of a middle class that wanted and could afford jewellery. As a result, the use of industrial processes, cheaper alloys, and stone substitutes led to the development of paste or costume jewellery. Distinguished goldsmiths continued to flourish, however, as wealthier patrons sought to ensure that what they wore still stood apart from the jewellery of the masses, not only through use of precious metals and stones but also though superior artistic and technical work. One such artist was the French goldsmith Françoise Désire Froment Meurice. A category unique to this period and quite appropriate to the philosophy of romanticism was mourning jewellery. It originated in England, where Queen Victoria was often seen wearing jet jewellery after the death of Prince Albert, and it allowed the wearer to continue wearing jewellery while expressing a state of mourning at the death of a loved one. In the United states, this period saw the founding in 1837 of Tiffany & Co. by Charles Lewis Tiffany. Tiffany's put the United States on the world map in terms of jewellery and gained fame creating dazzling commissions for people such as the wife of Abraham Lincoln. Later, it would gain popular notoriety as the setting of the film Breakfast at Tiffany's. In France, Pierre Cartier founded Cartier SA in 1847, while 1884 saw the founding of Bulgari in Italy. The modern production studio had been born and was a step away from the former dominance of individual craftsmen and patronage. In China,the most uncommon piece of jewellery was the earring, which was worn neither by men nor women. Amulets were common, often with a Chinese symbol or dragon. Dragons, Chinese symbols, and phoenixes were frequently depicted on jewellery designs. Jewellery in the Indus Valley was worn predominantly by females, who wore numerous clay or shell bracelets on their wrists. They were often shaped like doughnuts and painted black. Over time, clay bangles were discarded for more durable ones. In present-day India, bangles are made out of metal or glass. Other pieces that women frequently wore were thin bands of gold that would be worn on the forehead, earrings, primitive brooches, chokers, and gold rings. Although women wore jewellery the most, some men in the Indus Valley wore beads. Small beads were often crafted to be placed in men and women’s hair. The beads were about one millimetre long. A female skeleton (presently on display at the National Museum, New Delhi, India) wears a carlinean bangle (bracelet) on her left hand. According to Hindu belief, gold and silver are considered as sacred metals. Gold is symbolic of the warm sun, while silver suggests the cool moon. Both are the quintessential metals of Indian jewellery. Pure gold does not oxidise or corrode with time, which is why Hindu tradition associates gold with immortality. Gold imagery occurs frequently in ancient Indian literature. In the Vedic Hindu belief of cosmological creation, the source of physical and spiritual human life originated in and evolved from a golden womb (hiranyagarbha) or egg (hiranyanda), a metaphor of the sun, whose light rises from the primordial waters. The Mughal reign was the most significant period of time in relation to jewellery. A lot of jewellers prospered from the sixteenth to the nineteenth century. Jewellery had great status with India’s royalty; it was so powerful that they established laws, limiting wearing of jewellery to royalty. Only royalty and a few others to whom they granted permission could wear gold ornaments on their feet. This would normally be considered breaking the appreciation of the sacred metals. Even though the majority of the Indian population wore jewellery, Maharajas and people related to royalty had a deeper connection with jewellery. The Maharaja's role was so important that the Hindu philosophers identified him as central to the smooth working of the world. He was considered as a divine being, a deity in human form, whose duty was to uphold and protect dharma, the moral order of the universe. Among the Aztecs, only nobility wore gold jewellery, as it showed their rank, power, and wealth. Gold jewellery was most common in the Aztec Empire and was often decorated with feathers from Quetzal birds and others. In general, the more jewellery an Aztec noble wore, the higher his status or prestige. The Emperor and his High Priests, for example, would be nearly completely covered in jewellery when making public appearances. Although gold was the most common and a popular material used in Aztec jewellery, jade, turquoise, and certain feathers were considered more valuable. In addition to adornment and status, the Aztecs also used jewellery in sacrifices to appease the gods. Priests also used gem-encrusted daggers to perform animal and human sacrifices. Another ancient American civilization with expertise in jewellery making were the Maya. At the peak of their civilization, the Maya were making jewellery from jade, gold, silver, bronze, and copper. Maya designs were similar to those of the Aztecs, with lavish headdresses and jewellery. The Maya also traded in precious gems. However, in earlier times, the Maya had little access to metal, so they made the majority of their jewellery out of bone or stone. Merchants and nobility were the only few that wore expensive jewellery in the Maya region, much the same as with the Aztecs. In North America, Native Americans used shells, wood, turquoise, and soapstone, almost unavailable in South and Central America. The turquoise was used in necklaces and to be placed in earrings. Native Americans with access to oyster shells, often located in only one location in America, traded the shells with other tribes, showing the great importance of the body adornment trade in Northern America. Nowadays a wide range of such traditionally-inspired items such as bone carved pendants based on traditional fishhooks hei matau and other greenstone jewellery are popular with young New Zealanders of all backgrounds – for whom they relate to a generalized sense of New Zealand identity. These trends have contributed towards a worldwide interest in traditional Māori culture and arts. The late 20th century saw the blending of European design with oriental techniques such as Mokume-gane. The following are innovations in the decades straddling the year 2000: "Mokume-gane, hydraulic die forming, anti-clastic raising, fold-forming, reactive metal anodising, shell forms, PMC, photoetching, and [use of] CAD/CAM." Artisan jewellery continues to grow as both a hobby and a profession. With more than 17 United States periodicals about beading alone, resources, accessibility, and a low initial cost of entry continues to expand production of hand-made adornments. Some fine examples of artisan jewellery can be seen at The Metropolitan Museum of Art in New York City. The increase in numbers of students choosing to study jewellery design and production in Australia has grown in the past 20 years, and Australia now has a thriving contemporary jewellery community. Many of these jewellers have embraced modern materials and techniques, as well as incorporating traditional workmanship.